Figure out a way to get into the Crystal Tower with the help of Clavicus Vile and Mephala. With the Ritemaster dead and the Heart of Transparent Law in Nocturnal's hands, events have taken a grim turn. I need to help the Psijic sages figure out a way to enter the Crystal Tower and stop Nocturnal. Interrogate Leythen in Valsirenn's study. Go to the Crystal Tower Gatehouse and help with the Sapiarchs. Find out what Clavicus Vile wants. Report back to Valsirenn on Artaeum. Talk to Oriandra to start the quest. "Grief does us no good unless we use it to focus our commitment. We need to rally our forces. It's time to turn this Daedric tide before the waters of Oblivion overwhelm us. Thankfully, Sotha Sil returned while you traveled the Dreaming Cave." Did Sotha Sil have any news to share? "Sotha Sil said he had information meant only for Ritemaster lachesis's ears. He asked me to send the Ritemaster to see him when he returned from traveling the Dreaming Cave." Someone needs to tell Sotha Sil that the Ritemaster is dead. "We also need to convince Sotha Sil to share the news he brought with us. But without the Ritemaster, he may decide to simply depart. Like all the members of the Dark Elf Tribunal, he can be very enigmatic. Maybe you should talk to him." I'll speak to Sotha Sil. "How unusual. The Psijics know better than to disturb me in my private study. And the Ritemaster has kept me waiting for an inordinate amount of time. That leads me to a single conclusion—the Ritemaster has not returned from the Dreaming Cave." "How unusual. The Ritemaster has kept me waiting for an inordinate amount of time, but instead of Iachesis, here comes the savior of the Clockwork City. The Ritemaster is dead. Nocturnal killed him. "That is unfortunate. I enjoyed my infrequent talks with Iachesis. Ah, well. Now if you don't mind, I have preparations to make before I take my leave." You're just going to leave? But I thought you had information to share with the Ritemaster? "I am and I did. But the Ritemaster is no longer in a position to receive that information. Now, once again I ask—"
We need your help to stop Nocturnal. Tell me what you were going to tell the Ritemaster. Then hear my words. Nocturnal stole a secret I thought well hidden. I developed a technique for utilizing life energy as a source of power. I suspect she will use that technique to amplify the Crystal Tower." What will amplifying the Crystal Tower do? "The Crystal Tower exists on multiple planes of reality simultaneously and possesses capabilities we do not fully understand. We must assume that Nocturnal's options are infinite. I suggest you find Valsirenn and inform her of this development." Nocturnal's no longer working with the other Daedric Princes. "I find it hard to believe that Nocturnal, Mephala, and Vile worked together for as long as they did. Daedric Princes aren't known for their willingness to share. With the Heart, Nocturnal moves one step closer to gaining control of the tower." Why is the Heart so special? "Transparent Law, the crystal at the top of the Crystal Tower, anchors its metaphysical structure to all realities. With the Heart, she can restore the crystal, utilize its capabilities, and make herself master of the tower." How can the Crystal Tower exist on multiple planes at the same time? "The tower straddles every reality. Its true purpose remains lost to time, but I theorize it was created as a watchtower of sorts. A doorway to everywhere. It stands to reason, then, that the tower is the key to omnipresence." How does that help Nocturnal? "Imagine a Daedric Prince who can exert influence throughout the multiverse at the exact same moment in time. Nocturnal could become infinite. If she accomplishes that, then her power would multiply accordingly. She would be … without limits." When you're done talking to Sotha Sil, the Golden Knight will burst into the room. Darien Gautier: "You need to go to Valsirenn's study right now. There's a problem. Sotha Sil: "Knight of Meridia, stay and talk with me." Head on over to Valsirenn's study. When you arrive, you will be greeted by commotion. Oriandra: "Valsirenn, stop! You're going to kill him!" Valsirenn: "Arrgh! Fine! Let our friend finish the interrogation." Talk to Leythen and figure out what's going on. "This is ridiculous! I had no wish to see Iachesis harmed. He was my friend! He tried to save my daughter! If my wife wants a battle, though, tell her I'm ready to oblige!" Nocturnal betrayed your Prince when she killed the Ritemaster and took the Heart for herself. "What are you talking about? Nocturnal, Mephala, and Clavicus Vile are partners in this. That's why our three sects formed the Court of Bedlam. Three Daedric Princes working together to make the world a better place." I saw Nocturnal banish Mephala and Vile from her realm. I don't think she's still part of your team. You must let me leave Artaeum! I need to contact my Prince!" You now have two options: to intimidate Leythen, or keep talking as you are. [Intimidate] Tell me what the Princes were originally planning or I'll turn you back over to Valsirenn. "Look, you have to let me return to Summerset and warn my Prince. Let me go and I'll convince Mephala to help you. You're going to need my Prince if you really plan to take on Nocturnal and the Crystal Tower. Consider it a necessary alliance." We need to know what the Princes were originally planning. "And I need to return to Summerset, but it looks like we're both going to be disappointed." Whatever Nocturnal has planned is a threat to Mephala and the rest of the Court of Bedlam. "Which is why I have to warn my Prince! Look, help me and I'll help you. You're going to need my Prince if you have any hope of taking on Nocturnal. Consider it a necessary alliance." First, tell me the triad's original plan. "Do we really need to go over this again? Mephala and the triad sought places of power—the Clockwork City, the Crystal Tower—anything they could use to change the rules of reality and remake the world. They wanted to make things better!" Why would Nocturnal betray the triad and take the Heart? "I still only have your word that my Prince has been betrayed. But I'll play along. Daedric Princes aren't used to working together. If Nocturnal acquired the Heart of Transparent Law, I could see how she might then decide to go her own way." So you think she'll use the Heart to take control of the Crystal Tower? "I was under the assumption that the triad needed to work together to take control of the Crystal Tower. That was always my understanding. To attempt this on her own, Nocturnal must have found another source of power." How were the Princes planning to enter the Crystal Tower? "The Crystal Tower has its own protections, though we know those have been weakened with the removal of the Heart of Transparent Law. Still, we tried to acquire the Resolute Diamonds, the Sapiarchs' keys to the tower." So without the Sapiarchs' keys, Nocturnal can't enter the Crystal Tower? "I didn't say that. Nocturnal has the Heart and her power as a Daedric Prince. It won't be easy, but she'll be able to enter the Crystal Tower. You, on the other hand, will need help. Which brings me back to my offer. Make an alliance with my Prince." What happens to the Court of Bedlam now? "What Court of Bedlam? You dealt with Clavicus Vile's earl and I'm your prisoner. The Court is in shambles, just like the triad, if what you say is to be believed. But beware Nocturnal's champion. Her earl won't fall as easily as Tilcalar or I." Talk to Valsirenn and see what she thinks of all of this. "Leythen is a shell of the man I fell in love with. We can't trust anything he says. No, we have to deal with this ourselves. And the key is reaching the Crystal Tower before Nocturnal can accomplish a similar feat." 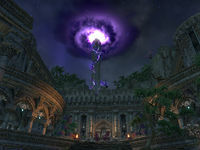 Sotha Sil says that Nocturnal stole his secret for using life energy as a source of power. "Just another horrible bit of news in an otherwise horrible situation. All the more reason for us to get to the Crystal Tower. Last I heard, the Sapiarchs were attempting to rapidly attune two new tower sentinels. We need to see if they succeeded." Where are the Sapiarchs attempting the attuning ritual? "Likely at the Crystal Tower Gatehouse, northeast of Lillandril. The ritual usually requires a full year and a day to complete, but the Sapiarchs reluctantly agreed to try to speed up the process. We should head out immediately." I'll meet you at the Crystal Tower Gatehouse. When you arrive, you'll find Razum-dar talking to some Sapiarchs. Razum-dar: "No more stalling! Tell Raz what's happening at the Crystal Tower. Now!" Sapiarch Uudilwen: "Climb the watchtower and see for yourself." Sapiarch Tumbadoril: "Why did you tell him that?" Sapiarch Uudilwen: "His teeth were very sharp, Tumbadoril." Follow Razum-dar up the stairs and speak with him. There's an ominous purple rift above the Crystal Tower. Razum-dar: "The Crystal Tower isn't supposed to do that, yes?" Sapiarch Isinborn: "The tower started glowing right before you arrived." "Raz was nearby when he heard that the Sapiarchs were up to something at the Crystal Tower. This one didn't expect the tower to start glowing. I hope this is the work of the Psijics, yes? No. This is something worse. Raz feels it in his paws." Nocturnal has the Heart of Transparent Law. This could be her doing. "Daedric Princes. Raz hates those things. And this one supposes that if Nocturnal takes control of the Crystal Tower, that would be bad for Summerset, yes?" Sotha Sil says she could use the Crystal Tower to become infinitely powerful. "So that would be a yes on the bad for Summerset question. Infinite. A number so big it makes Raz's head swim just trying to imagine it. So, what should we do about this? You have a plan to save the day, yes?" The Sapiarchs are trying to create a new pair of sentinels so we can enter the Crystal Tower. "So that's what the Sapiarchs are doing at the gatehouse! Raz should have known. Magic makes this one's fur stand on end. All right. Let's go to the gatehouse and see how the Sapiarchs are coming along before something else happens to the tower." Let's go to the gatehouse. Suddenly, the top of the tower appears to break apart, held in place by an ominous violet glow. Sapiarch Isinborn: "The tower! What's happening?" Razum-dar: "Raz thinks this is bad." Razum-dar: "Come, my friend! To the gatehouse!" When you arrive at the gatehouse, the new sentinels will be focusing their diamond keys' energy on the tower's locks, overseen by Valsirenn. Sapiarch Illmildil: "Don't lose... focus!" Sapiarch Rundirwe: "The diamond key... it won't meld with me!" Valsirenn: "Keep trying! We need to open these gates!" "Time is running out. The Sapiarchs still haven't completed their ritual, and now Nocturnal has launched an attack against them. I sent Darien and Razum-dar to defend the Sapiarchs, but the Daedra keep on coming!" "While the Sapiarchs here work to attune themselves to the Resolute Diamonds, other Sapiarchs perform their parts of the ritual at the north and south platforms. Nocturnal has sent Daedra to disrupt the ritual platforms. You need to stop them." Do as Valsirenn says and stop the Daedric incursions. Fight through the waves of Daedra at the north and south platforms, then return to Valsirenn and the Sapiarchs with the keys. They appear to be struggling with the diamond keys... then a burst of umbral energy is discharged from both keys, killing the Sapiarchs. Sapiarch Illmildil: "The energy. Something feels wrong." Sapiarch Rundirwe: "No. I think it's work— arrgh!" Razum-dar: "That was unexpected, yes?" Darien Gautier: "The Sapiarchs are dead. Now what do we do?" Talk to Valsirenn and try to figure out where to go from here. "I knew this wasn't going to work. Speeding up the Sapiarch ritual was a long shot, at best. We should have had the Conclave working on a solution all along. The Psijics could have figured out how to attune the Resolute Diamonds." Isn't that still an option? "You're right. Even without the Ritemaster, we can still do this. I can take the Resolute Diamonds and return to Artaeum immediately. But... but... well, I'm kind of at a loss as to what we should do next." We could try Leythen's suggestion and seek help from Mephala and Clavicus Vile. "No, that was a bad idea the first time Leythen suggested it. I'll take the diamonds to Artaeum and get to work immediately. Meanwhile, I need you to go to Alinor and warn the Proxy Queen. She has to make sure Summerset is prepared. Just in case." Your idea seems like the best option. Have the Psijics figure our how to use the diamond keys. "I'll take the diamonds to Artaeum and get the Conclave working on them immediately. Meanwhile, I need you to go to Alinor and warn the Proxy Queen. She has to make sure Summerset is prepared for the worst— just in case." I'll go to Alinor and warn the Proxy Queen. Valsirenn: "Darien, gather the diamond keys. The Psijic Order will do what the Sapiarchs could not." Darien Gautier: "No. I'm done with the Psijic Order. Too many deaths, not enough action." Razum-dar: "Raz will meet our friend in Alinor. You two do what you must." Find Razum-dar in Alinor and speak with him. "This one has seen many bizarre things working as an Eye of the Queen, but this may take the moon-sugar cake! A strange dog walked up and spoke to Raz!" A dog spoke to you? "That's what Raz said! A dog. It spoke words as clear as day. It gave me a message to give to you. The dog said you should meet it in the gardens because it had something important to tell you." I'll find the strange dog. You go warn the Proxy Queen. "Yes, yes, Raz will go warn the Proxy Queen. That would be for the best. Just be careful, my friend. This one doesn't trust dogs, especially ones that talk. Talking animals, so unnatural, yes?" Go find the talking dog in the Alinor Gardens. Strange dog: "You again? All right, follow me." Follow the dog to an alleyway, where it reveals itself to be the one and only Barbas. Barbas: "It's me, Barbas. Let's talk." "Vile told me to find the mortal flea that continues to pester him and deliver a message. He's terrible with mortal names, but I immediately thought of you. Glad to see that my intuition's as sharp as ever! Oh yeah. I've got a message for you." "My master's less than pleased with the way Nocturnal treated him. He wanted to be the first one to betray the triad. Look, he wanted me to make sure to tell you he's not upset about the whole Vivec thing. At least, not any more." What does Clavicus Vile want to talk about? "Probably wants to make some kind of a deal. That's his bread and butter, you know. You can do what you want, but I figure you're even more angry with Nocturnal for the way she evaporated your friend and took the Heart of Transparent Law." So how do I talk to Clavicus Vile? "He told me you could find him in the caves just north of the city, Just be nice to him when you get there. He's still a little upset over how the triad broke up and all that." I'll go to the caves and talk to Clavicus Vile. "My master has been livid since Nocturnal betrayed him. That's why I've been keeping my distance. Do me a favor and try not to make him any more irritated when you talk to him. I'd hate to see something bad happen to you. Oh wait, no I wouldn't." Find the caves north of the city that Barbas was talking about. Barbas will be waiting for you at the cave's entrance. Barbas: "Look at that, you can follow directions! My master's waiting for you deeper inside." You can speak with Barbas here. Barbas: "I think I'll wait here. Vile let some of his more ferocious minions loose in the cave, and sometimes they don't differentiate between friend and food. Try not to get killed before you hear what my master has to offer." So there will be monsters, possibly Daedra in the cave. Got it. Thanks, Barbas. Enter the caves, cut down as many Skaafin as you like, and make your way to where Clavicus Vile wants to meet you. When you finally arrive, you will be greeted with the sight of Clavicus Vile brutally murdering his loyal cultists. A poor sod named Alderdon gets this treatment last, and his corpse is subsequently possessed by the Prince of Bargains in a burst of red light. Alderdon: "Please, master! Mercy— arrgh!" Clavicus Vile: "Even in death, they serve! So the Hound found you? Good. Let's discuss an arrangement, shall we?" "Don't let these crumbled husks trouble you. I needed to vent my frustrations and my loyal followers were close at hand." You wanted to talk to me? "Yes. Yes I did. I assumed Barbas would have made that clear. I admire your persistence almost as much as I hate the fact that you constantly oppose me. Still, Nocturnal couldn't dispatch you, which indicated you may be useful to me after all." "We have a common cause now, you and I. A common enemy. Nocturnal turned her back on our alliance. She betrayed the triad. Worse, she betrayed me! Consider my words carefully before you response. I can grant you access to the Crystal Tower." Why should I trust anything you say? "You killed my Court of Bedlam earl. You dispatched our pet Sea Sload. I hate you, but I also respect you. And I need your help to gain vengeance against Nocturnal. So I ask you this: How could you not trust me? Isn't the enemy of my enemy my friend?" All right. So tell me how I can enter the Crystal Tower. "Upstairs you'll find a key. With it, your Psijic friends can get you to my realm, where I can direct you to the Crystal Tower. Getting inside, though. For that, you'll need the Resolute Diamonds. Unfortunately, I can't help you with that." How can I reach the Crystal Tower by going through your realm? "Haven't you learned anything? The Crystal Tower exists in all realms. In my realm, however, there is no gatehouse to block your way. Just the tower's own defenses. And for that, unfortunately, you'll need the diamond keys." But the diamond keys need to be attuned and the tower sentinels are dead. "A problem, certainly, but one I'm sure you can overcome. Perhaps another Prince would be willing to help you. I leave the details of that to you. Just remember this favor I have provided when you restore the tower and save your beloved Nirn." And what do you get in return for this favor? "I'm sure something of value will suggest itself when the time is right. I promise that whatever I ask for as a compensation, it will not unduly cost you— anyway, no more than you can afford. On that, you have my word." With Clavicus Vile departed and the corpse of Alderdon once again slumped on the floor, Valsirenn appears before you in a projection. Valsirenn: "Can you hear me? I have troubling news." Speak with her to find out what is wrong. "The Golden Knight has taken matters into his own hands! He set Leythen free and returned with him to Summerset." Why would Darien set Leythen free and go with him to Summerset? "Who knows what all that time in Meridia's realm did to Darien's mind? He couldn't have gotten off the island without Leythen's help, and Leythen needed his assistance to circumvent the wards placed upon him. I need you to find out what they're up to." "I sense Darien in Summerset's northwest region. But Leythen's magic prevents me from identifying a more precise location. Please. I need your help. The Resolute Diamonds are proving more difficult to unravel than I imagined and there's no one else." I'll look for Darien and Leythen in northwestern Summerset. Valsirenn: "I'll find you as soon as the Resolute Diamonds are ready to use." Look for Darien and Leythen. Think back to Leythen— he worships Mephala, and the last time you spoke, he tried to convince you to allow him to contact his Prince. Where on Summerset could they possibly have gone? The Cathedral of Webs, of course! When you arrive, Leythen is trying to open the door to the Cathedral, with Darien at his side. Darien Gautier: "Hurry up, Leythen! They could find us at any moment!" Darien Gautier: "Wrong? Why doesn't that surprise me?" Speak with Darien. He should have something to say about this. "Now don't get mad, but there's a perfectly good explanation for why Leythen and I busted out of Artaeum and came to this charming little "hideaway"." "The intentions of the Psijics are good, but we're running out of time. From what we saw at the gatehouse, Nocturnal has already taken control of the Crystal Tower. Drastic action is called for and Leythen's agreed to put us in contact with Mephala." Is that really such a good idea? "Not you, too! I got enough doubt and dirty looks back in Artaeum! Look, Mephala was betrayed by Nocturnal. It stands to reason she might want to help us. And we could certainly use the power since I still can't make contact with Meridia." You're right. Making an alliance with the betrayed Princes is our best option right now. "I knew I could count on you! As for Leythen, you should talk to him. We can make him pay for his crimes later. Right now, we need him to help us or we could lose everything." Now you should speak to Leythen about the door. "If you want to return me to Artaeum, I won't resist you. But first, I need to find out if the rest of Mephala's followers are safe. Let me learn their fate and then I'll submit myself to your mercy." Darien said you were willing to put us in contact with Mephala. "I am, but I'm surprised that you'd go along with that. If we can get inside and reach Mephala's shrine, I can attempt to make contact with my Prince." So you believe that Nocturnal betrayed your Prince now? "Not exactly, but it's obvious to me that you believe that's what happened. I need to see for myself. In any event, there's no harm in approaching Mephala's shrine. I'm just a little concerned that it took me so long to open this door." Why does the door concern you? "It should have been a simple matter to identify myself and unlock the door. But the spells in place resisted me. It's as if I've lost my status as Mephala's earl … or as if someone or something interfered with the place's defenses." Head inside the shrine with your companions and assess the situation. It's a mess in there. The bodies of dead Mephala cultists lay strewn across the floor of the shrine, and Leythen is clearly upset. Leythen: "How did this happen? My people should have been safe within these walls." Darien Gautier: "Nocturnal's been eliminating the sects of the other Princes. Are you surprised she'd turn on her former allies?" Leythen: "I recruited most of these men and women. I was responsible for them." Darien Gautier: "Scout ahead and find the shrine. I’ll stay with Leythen until he's ready to move on." Head on further into the shrine and defeat the gloam yaghra in your path. Further in, you come across a familiar face across the broken chasm of what used to be a great hall. It's Veya— er, Tundilwen! Veya Releth: "It pains me that it had to end this way, but my Mistress will not be denied." Leythen: "Butcher! How dare you pretend to care about the men and women you slaughtered!" Veya Releth: "Every action I performed was in the service of Nocturnal's grand plan." Darien Gautier: "Leythen, she has my Dawnbreaker. Ask her if she'll kindly return it." Talk to Leythen. Maybe he has an idea on how to get Nocturnal's earl to tell you what's going on. "I never trusted Nocturnal's earl. A Dark Elf, in the Court of Bedlam? It was unprecedented! Her daggers are as sharp as her temper, so we must tread carefully here." "Nocturnal's champion is reckless and quick to anger. We can take advantage of that, perhaps get her to slip up and reveal what's going on here. There's a scent of magic that makes my blood run cold." "Nocturnal's magic is at work here. See how the yaghra have mutated into creatures of shadow? We need to follow Nocturnal's earl. Harry her. Make her so mad she tells us everything. Hopefully, one of us will live long enough to use the information." Leythen then will attempt to draw information out of the Earl of Nocturnal. Leythen: "Champion of Nocturnal, what magic is this? I've never seen anything like it." Veya Releth: "This was always the plan. Nocturnal's plan." Leythen: "So Nocturnal did betray my mistress!" Veya Releth: "Your mistress is weak. Come with me and I'll show you what the true power looks like!" Leythen teleports to the other side of the chasm and goes after Nocturnal's champion. Darien Gautier: "Leythen, no! Come on, we can't let them get away!" Give chase to Leythen and Veya. When you catch up with them, you'll find a defiled statue to Mephala, and in front of it, a large abyssal pearl. Leythen seems flabbergasted. Veya traps Leythen in shadow, freezing him in place. Leythen: "This magic, it destroys everything! What good is power if there's nothing left to rule?" Veya Releth: "This is what the Court wanted all along. An end to the old ways. A new beginning." Leythen: "I won't be party to the death of innocents! I won't—"
Darien Gautier: "Let him go!" Veya Releth: "Be silent, knight, or I'll let you taste the blade you once carried. I wish to speak to your friend now." Talk to Veya and figure out what she has to say for herself. You'll have special dialogue for Veya (or "Tundilwen") if you met her before in Balmora in Morrowind. "I'm sorry it had to come to this, but nothing can stop the magic of the pearls now. My Mistress offers a small mercy. Leave her to finish her work and she'll kill the Psijics quickly. But if you interfere, you will all suffer before you die." What are you doing with the abyssal pearls? "The Sea Sload trinkets? It was an easy matter for my Mistress to alter the magic. To use their ability to siphon life energy and funnel it into the Crystal Tower. In the end, your own world will provide the power that spells its doom!" Veya, you can't let Nocturnal destroy the world! "Stop calling me that! Veya died on a cold, hard floor in Balmora. I'm Tundilwen now, champion of Nocturnal! As the Crystal Tower fills with power drawn from this dying world, it will provide my Mistress with what she needs to remake reality." So why betray the other Princes? "Mephala and Clavicus Vile are fledglings compared to my Mistress! Nocturnal existed before this reality was even imagined, and she will ride its destruction into the next! This isn't an end— it's a new beginning!" I'll find a way to stop you. Veya Releth: "Good luck with that. Now stay out of the way or death will be the least of your concerns." Talk to Leythen and gather your wits. "Nocturnal must pay for betraying my Mistress, but the magic of the abyssal pearls appears to do more than just siphon our life energy. It obscures my connection to Mephala. This shrine may be blocked, but I may know another way." Don't you need the shrine to contact Mephala? "While a consecrated shrine offers the best conduit to a Daedric Prince, there are other means. In the back chambers, I have a way to communicate privately with my Prince. I should be able to open a connection there." Will Nocturnal's earl try to stop us? "She's gone. I no longer sense her presence here. The abyssal pearls, however. The Court helped seed them throughout Summerset. I can tell the Psijics where to find them before Nocturnal activates them all. First, though, we must contact Mephala." Leythen: "Darien, go the other way and meet us in the back chambers. We want to make sure Nocturnal's earl didn't leave us any surprises." Darien Gautier: "I'll go, but if this is just a ploy so you can betray us, you'll have to deal with me." Continue on. The path ahead is rather easy, but you'll encounter a yaghra monstrosity. Destroy it. Darien will also meet up with you here. Both Darien and Leythen something to say here. Leythen: "Destroy that creature and then I can contact my Prince!" Darien Gautier: "There you are! This place is—Meridia's light! What is that thing?" Leythen: "Meet me outside and we'll make contact with my Prince." Leythen: "Mephala, appear before your faithful servant!" Mephala: "I answer my earl's summons, only to find him with these … unworthies. Do you betray me too, Leythen?" Leythen: "Never, my Prince. We share a common enemy now. Please, talk to them and hear what they have to say." "So, the mortal who opposed me wants to speak. If what you say doesn't interest me, I will order Leythen to kill you." Nocturnal threatens us all. I've made a deal with Clavicus Vile. Now I want to negotiate with you. "And what did the cowardly Prince of Bargains off you? Was it something so intriguing that you would risk my wrath, as well? Speak before my patience wears thin!" Vile offered passage to the Crystal Tower through his realm, but we need to attune the diamond keys. "You would challenge Nocturnal in the Crystal Tower? Since gaining the Heart of Transparent Law, the tower serves as an extension of her own realm. It amuses me that you want to thwart her plans. She'll destroy you, of course, but I am still amused." Could you make the diamond keys work so we can enter the Crystal Tower? "How desperate you must be to offer the very relics I once sought! I will think upon your request. Before you enter Vile's realm, have my earl contact me again. At that time I will either help you… or I won't. As is my prerogative." We'll contact you when we're ready. Darien Gautier: "That's it? A maybe?" Earl Leythen: "I'll return to Artaeum with Darien and tell them what we learned. Meet us there." Enter Ceporah Tower and speak with Valsirenn to end the quest. "We've failed. The Conclave, despite its best efforts, wasn't able to attune the Resolute Diamonds. We can't use the diamond keys to enter the Crystal Tower. But what about you? Were you able to track down Darien and the traitor Leythen?" I found them. Leythen helped me determine Nocturnal's true plan. She wants to remake reality. "Using the Crystal Tower and Sotha Sil's technique for utilizing life energy? Then we really are doomed. Without a way into the Crystal Tower, we can't even attempt to challenge Nocturnal, let alone stop her." Clavicus Vile offered to let us use his realm to reach the Crystal Tower. "Is that what the Psijic Order is reduced to? Forced to accept help from the same Daedric Princes that got us into this trouble in the first place? Still, going to the tower won't matter if we can't use the diamond keys to get inside." Mephala might be able to help us attune the Resolute Diamonds. "I opposed this line of reasoning when Leythen first suggested it, as bargains with the Princes don't often end well. But what choice do we have? Still, thanks for finding a way forward. While it's a long shot, at least it represents a chance." Sotha Sil has news for the Ritemaster. I should go to his study in Ceporah Tower and try to convince him to share that news with me. Sotha Sil suggested I go to Valsirenn and inform her of his speculations concerning Nocturnal and the Crystal Tower. I reached Valsirenn's study to find her trying to force information out of Leythen. She wants me to talk to him and finish the interrogation. Leythen suggested we make an alliance with Mephala to gain her help against Nocturnal. I should talk to Valsirenn and she what she thinks about that proposal. I need to go to the Crystal Tower Gatehouse, northeast of Lillandril, to meet Valsirenn and Darien. We're going to see how the Sapiarchs are progressing with their attempt to create two new tower sentinels. Razum-dar ran into the nearby watchtower. I should follow him and find out what he's doing here. Something terrible happened to the Crystal Tower. I need to get to the gatehouse and see how the Sapiarchs' ritual is coming along. Valsirenn appears to be helping the Sapiarchs with their ritual. I should talk to her and see if she has any information about what's happening here. I need to help defend the ritual platforms against the Daedric attack in order to give the Sapiarchs enough time to complete their ritual to attune the tower sentinels. We defended against the Daedra attacks on the ritual platforms. Now I should check on the new Tower Sentinels and see if they've completed the attunement to the diamond keys. The Sapiarchs trying to attune themselves to the diamond keys so they could open the way to the Crystal Tower are dead. I should talk to Valsirenn and find out what our next option is. I need to meet Razum-dar in Alinor so we can warn the Proxy Queen about Nocturnal's assault on the Crystal Tower. Razum-dar said I should go to the gardens in Alinor to look for a strange talking dog that has a message for me. I should follow the strange talking dog. Raz said it has a message to pass on to me. I followed the dog to an isolated location. I suppose I should talk to him now. The Hound of Clavicus Vile directed me to the caves north of Alinor. He said that his master would meet me and talk to me there. Clavicus Vile wants to talk to me somewhere in this cave. I need to find him. Clavicus Vile has killed and possessed one of his own cultists. Now he wants to talk to me. Clavicus Vile placed a key in the upper portion of the ruins. He says the Psijics can use the key to get me to Vile's Oblivion realm, and from there he can grant me access to the Crystal Tower. I should go and find the key. I acquired the key to Clavicus Vile's realm. Now Valsirenn has appeared to me as a projection. She seems upset. I should talk to her. Before I try to figure out how to best make use of Clavicus Vile's offer to grant me access to the Crystal Tower, Valsirenn asked me to find Darien and Leythen in the northwest region of Summerset and see what they're up to. I found Darien and Leythen. I should talk to Darien and find out what they're doing out here. Darien says that we need to get the help of the betrayed Daedric Princes and that Leythen has agreed to put us in contact with Mephala. I should talk to Leythen and see what he has planned. We need to enter the headquarters of Mephala's cult and find her shrine. Then Leythen can help us contact his Prince. We need to find Mephala's shrine so that Leythen can put us in contact with his Prince. Nocturnal's earl has given us a cryptic warning. I should talk to Leythen and see if he knows what she's talking about. Leythen left us and went with Nocturnal's earl deeper into the ruins. We have to follow them. Nocturnal's earl is willing to talk. I should follow Leythen's advice and try to get her to reveal her master's plans. Nocturnal plans to siphon the life energy of Nirn to increase the power of the Crystal Tower. And with that power, she plans to remake all of reality. I should talk to Leythen and see if he's willing to contact Mephala now. Leythen thinks he can contact Mephala if we go to his private chamber. I should follow him there. Leythen said I should meet him outside so we can make contact with Mephala. Mephala has answered Leythen's summons. I should talk to the Daedric Prince. I made deals with both of the betrayed Princes. I should return to Artaeum and talk to Valsirenn. She needs to hear what happened, and I should see if the Psijics have figured out how to use the diamond keys yet. Finishes quest I told Valsirenn that Clavicus Vile has agreed to get us to the Crystal Tower through his realm. Now I should let her know that Mephala is considering helping us attune the diamond keys. This page was last modified on 6 February 2019, at 01:20.